Dust off those boxes of old photographs and turn them into a beautiful heirloom show piece with the uniquely designed and innovative Insta-Album. Engineered to hold an abundance of photos, this 12” x 12” album with pre-attached fold out pages takes the work and worry out of the overwhelming album assembly process and allows you to delve straight into the fun of decorating and adding your photos so they are organized and ready to display! Each page has been labeled with exact matting measurements for perfect paper sizing, which eliminates the tedious and time consuming job of configuring measurements, as well as defined magnet placements should you wish to incorporate invisible magnetic closures! A wonderful album option that allows you to create a completed project easily in a relatively minimal amount of time, making it ideal for gift giving or to preserve and document your own special occasions, favorite vacations and wonderful family memories! We recommend purchasing several packages of your favorite Heartfelt Creations designer paper collections to complete this album. The pre-made card panels, tags and decorative paper included in each paper collection allows for quick and easy decorating! We also recommend purchasing the complementing Decorative Pocket Accents Die, the Petite Pocket Accents Die, the Elegant Pocket Accents Die, and the Ornate Pocket Accents Die to add functional, yet decorative pocket accents ready to hold your favorite photos or keepsakes! 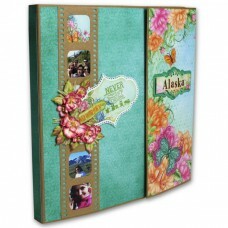 We suggest using the Bottle Cap Inc Vintage 1 Inch - 15 pack to make the most out of your Heartfelt Creations Insta-Album. Use these magnets as closures that will fit perfectly with the defined magnet placements, and give the album a nice, finished look. Elegant, bold and decoratively ornate the border and flourish dies within this assembling will provi.. Create ornate and delicate tag toppers, beautiful borders and whimsical pockets for use in all of yo.. When paired with the coordinating snow kissed collection, these mini ornaments and lush spruce frame..
Add interest to handmade greeting cards, scrapbook layouts and heirloom albums with uniquely shaped .. Disk magnets for albums or other protects requiring a magnet closure. these are very strong and will.. Ideal for creating diamond shaped openings in card fronts, or as decorative embellishments in scrapb.. Create perfectly sized decorative diamond die cuts for handmade greeting cards, scrapbook layouts, h.. Adding a hint of sophistication and elegance to any of your crafty creations is easily accomplished ..